Owen Wilson has co-scripted three excellent films with Wes Anderson -- Bottle Rocket, Rushmore, and The Royal Tenenbaums. He is better known as an actor, though, usually appearing in rather bland but commercially successful "buddy flicks" like Shanghai Noon and Shanghai Knights with Jackie Chan, I Spy with Eddie Murphy, and Starsky & Hutch and Zoolander with Ben Stiller. 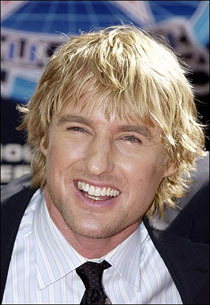 Of the movies' Wilson brothers, Owen is "the funny one", instantly recognizable by his complicated, oft-broken nose, and Luke is "the handsome one", seen as more of a serious actor. A third brother, Andrew Wilson, is a few years older and has been in movies longer, but has rarely been cast in anything but very small roles. Owen is also the Wilson who tried to kill himself in 2007, reportedly because of a painful break-up with Kate Hudson, his You, Me and Dupree co-star. Wilson co-starred with Ben Stiller in two comedies, the borderline brilliant Zoolander and the comparatively pedestrian Starsky & Hutch, and took smaller roles in several other Stiller flicks. Stiller also directed Heat Vision and Jack, an unsold 1999 pilot for an action-adventure-comedy series that would have starred Jack Black as a superhero and Wilson as his motorcycle.